Photo by Scott Bauer, courtesy of USDA ARS. 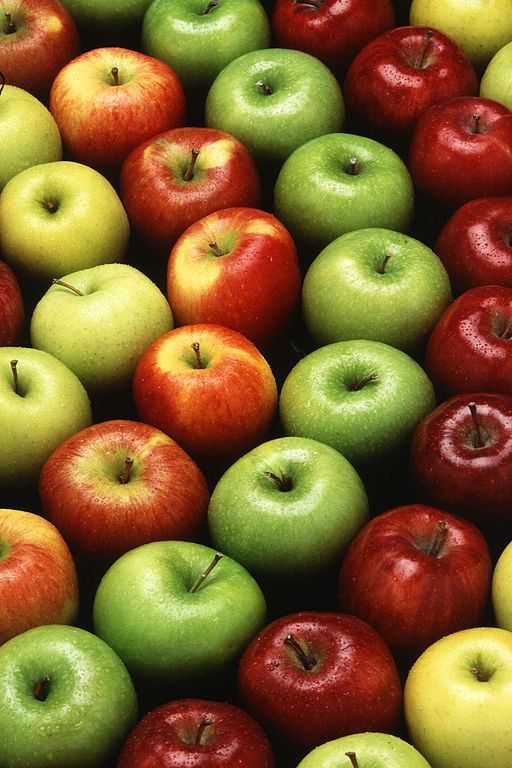 Apples; Photo by Scott Bauer/USDA ([file:field-file-license]). Many varieties of apple are grown in Washington state including Red Delicious, Golden Delicious, Fuji, Gala, Granny Smith, Braeburn, Jonagold, Pink Lady, and Cameo. About 100 packing houses store, sort, box and ship Washington Apples nearly all 12 months of the year. The majority of apple production occurs east of the Cascade Mountains in the central areas of the state. During 1997-2001 Washington's apple production averaged about 123 million bushels per year. According to the 2014 USDA Organic Survey, Washington State is the top producer in the U.S. of certified organic apples. Washington growers are able to produce apples using organic methods relatively successfully because of low disease pressure from apple scab and the absence of some key pests (such as Plum Curculio and Apple Maggot).